I've been following the amazing Kristina Werner on YouTube for some time now, and she makes the most beautiful cards that are deceptively simple. I love her style and tried for the first time some of the things she's shown in her videos, like die cutting the actual cardstock, rounded corners and doing dashlines. I used Ranger Kraft -cardstock and made a 4x5 inch cardbase. 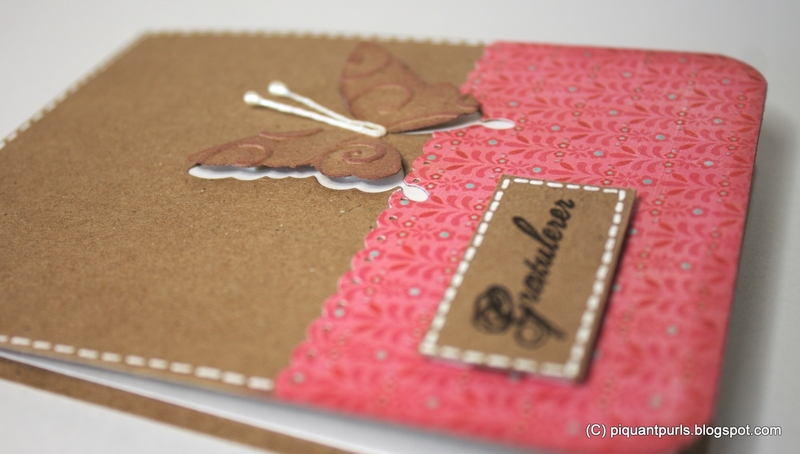 The butterfly is die cut with Simon Says exclusive Chrissy butterfly -die (can't add this in the Inlinkz because I have a free account there) and embossed with Couture Creations Intrinsic -embossing folder. One of the little wing ends came off as the embossing folder "ate" it, so I cut both off and you can see the white backing paper I glued on the inside of the card. The embossed pattern is shaded with DI in Victorian Velvet. The paper is from old Basic Grey "Urban Prairie" 6x6 stack and punched with equally old EK border punch. The paper is distressed with Victorian Velvet as well, and the white dashlines are made with my brand spanking new Uni-Ball Signo that everyone raves over. Yeah, it IS a lot better than Sakura Gelly Roller, the ink flows out much smoother. Finally the corners are rounded with the 1/2 inch corner chomper. Great card! I love the colors you used! That pink is gorgeous! Thanks for entering your card into the Simon Says Wednesday Challenge Blog!